The BBC are currently putting together a documentary about the people's history of pop music. You can contribute to this. Just click here to upload your memories and memorabilia at the People's History of Pop website and you could be a part of the BBC4 documentary to be shown in April. 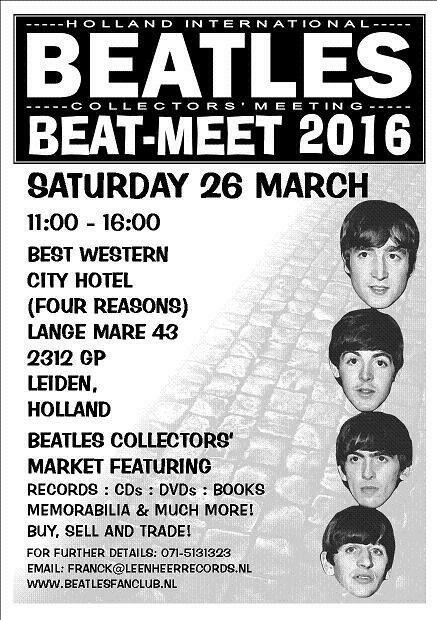 It's not just about The Beatles but all music. Enjoy. Whilst this is a Beatles Fan Club site, we cannot let the passing of rock legend David Bowie without putting a tribute to him on our site. 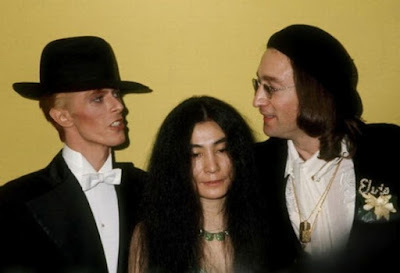 Bowie, as most Beatle fans know, befriended John Lennon in January 1975 in New York and jammed together. This jam session eventually produced the track "Fame", co-written by Bowie and Lennon. Lennon also sang backing vocals and played guitar. This became his first U.S. number one single. The pair then went to work on John's "Across the Universe". Both tracks appeared on the "Young Americans" album. Yoko Ono has said how David was like family and like a second father to Sean after John was sadly murdered in December 1980. He would take Sean to museums and they would hang out together in Switzerland where Sean was at boarding school. Our thoughts are with David's family and those close to him, including Yoko and Sean, at this time. From a personal point of view, I have always been a Beatles fan, and during the early 1970's the LP was a treasured item to own. Being just into secondary school, only a very small number of my friends owned any kind of LP. I was just starting my Beatles album collection, and a friend introduced me to the solo albums "All Things Must Pass" and "Imagine". Some of my friends were lucky enough to save enough to buy an LP from the local record shop called Spin a Disc. Looking back there were four albums that were the must have albums of the time. We weren't into the glam rock scene that was happening at that time. Rod Stewart's "Every Picture Tells a Story" featuring the hit single "Maggie May", Elton John's "Don't Shoot Me. I'm Only The Piano Player", "Nilsson Schmilsson", by Harry Nilsson and "Ziggy Stardust" by Bowie. We would talk about these 4 albums in particular during school breaks. Many of my friends preferred Bowie. They knew he was different. It's interesting in hindsight that John Lennon went on to work with three of these four artists in the next few years. John had good taste. I never really got Bowie at the time, but as time progresses it is easier to look back and see the influences he has had and still has even today. I only started to look at his work after his collaboration with Lennon. Probably one of the few artists without a genre, he moved with the times, like The Beatles, but was his own man and could drop a persona and create a new one at the drop of a hat. That was the excitement. You never knew what his next album or persona would be. His performance at Live Aid in 1985 is a stand out moment for me. Indeed, I was very excited at a new album this year and pre-ordered his final album "Blackstar". I received it on Friday, Bowie's birthday, played it and thought it was amazing. The lyrics became more poignant a couple of days later. Like many reading this, I and all of us at BBFC, were shocked and sad to hear of his passing. He died with dignity, and has left us a huge catalogue of great music. I feel that these words are not enough to do justice to the great man. Thank you David. Rest in Peace. In the words of Lennon and Bowie, "Imagine all the world, living life in peace, we can be heroes, just for one day".